There are three critical components of occupancy strength in any given lodging market. The first is an array of corporate entities that generate demand by bringing business travelers to the market. Secondly, a market needs tourist attractions to allure a different, but abundant, clientele from the regional, national, and international spheres. Convention facilities serve as the third component of the occupancy-generating machine, as they not only host very large groups, but typically bring the “in” from out-of-town demand. To best illustrate this dynamic, this article focuses on the markets of Southern California that contain the above components in abundance. A total of 335.4 million domestic leisure and business travelers and approximately 14.4 million international travelers descended on California in 2005, making it the most visited state in America. Californians themselves are the mainstay of the state's travel and tourism industry, accounting for 83% of domestic travel, or 279.8-million-person trips. Out-of-state visitors accounted for 55.5-million-person trips. Not all communities benefited equally from this enormous influx of visitation and expenditures and, in what follows, we will correlate these trends with the presence (or absence) of corporate, tourist, and convention demand generators. The Los Angeles-Long Beach area stands out as Southern California’s occupancy leader, followed by Anaheim-Santa Ana and San Diego. Los Angeles-Long Beach and San Diego occupancy levels climbed from the previous year, and the slight decline of Anaheim-Santa Ana’s levels can be attributed to the impact of new supply. The strength common to all three areas, however, is a diversity of corporate demand generators, convention and meeting facilities, and well-known tourist destinations. An average rate of just over $102.00, representing a nearly 9.0% increase over that of 2005, demonstrates the formidable strength of the Southern California market. Corporate travelers, who are generally less price-conscious than leisure travelers, have a significant impact on this position. Thus, it can be seen how important a thriving and complex business community is to the vitality of an area’s lodging market. Of course, many travelers to Southern California are drawn not by business but pleasure, and the region’s hugely popular weekend destinations complement its corporate activity. The glamorous suburbs of Hollywood and Beverly Hills attract legions of shoppers and sightseers to the multi-cultural metropolis of Los Angeles, and areas such as the Santa Monica Pier and Catalina Island remain popular with vacationers. The enormous popularity of Disneyland and Knott's Berry Farm resorts, the multitudinous beaches, and the upscale South Coast Plazashopping center serve as more of Orange County’s enticements. Vacancy can also be scarce in San Diego, as attractions such as SeaWorld and the San Diego Zoo contribute to sell-out weekends during peak vacation seasons. Specific, ultra-popular events can make the tourist angle even more dramatic. During the 2005 peak season, for example, Anaheim-Santa Ana owed its leading occupancy levels to the celebration of Disneyland's 50th anniversary. If we reverse our view through the looking-glass, we can see that the other areas of Southern California show a relative lack of the corporate, tourist, and convention components compared to the occupancy leaders, and hence a lesser degree of penetration. Santa Barbara caters primarily to tourism and business services, while Goleta and Carpinteria are home to an array of technological and agricultural enterprises. Furthermore, growing popularity of California wine has led to greater revenues for vintners in the county, and vineyards of all sizes dot this part of the region’s landscape, attracting a select clientele. The Danish-inspired village of Solvang is a major tourist attraction for the Santa Ynez Valley Region. Despite their charming and distinct allure, however, these areas of Southern California have been unable to keep up with the positive trends experienced by Los Angeles, Orange, and San Diego Counties. Each Southern California submarket follows the same general annual demand pattern, experiencing the strongest occupancy levels in the summer, and a secondary peak in April with the influx of business and convention demand. Lodging activity across all segments of demand tends to be at its lowest in December and January. As illustrated in the above graphs, the Riverside-San Bernardino market does not experience a summer pattern in step with the other Southern California markets. However, a stronger occupancy pattern shows signs of emergence in this region during the next decade. Although tourism and lodging growth is currently heightened in other areas of Southern California, the Inland Empire (San Bernardino County and part of Riverside County) does have one of the most robust and growing economies in the nation. The Inland Empire’s leverage for industry is based on its favorable characteristics of land cost and highway capacity. Some of the nation's largest manufacturing and shipping companies have chosen the Inland Empire for their distribution facilities, including Toyota Motor Corporation's North American Parts and Logistics Distribution Center in Ontario and APL Logistics in Rancho Cucamonga. While manufacturing and distribution do not inherently generate demand, the economic bustling they produce coupled with the resources of their parent corporations creates fertile ground for lodging growth. For example, in Ontario, an 8,200-acre New Model Colony is being planned for development into a mixed-use area of residential homes, industrial and business parks, and town centers. A 10,000-seat arena is scheduled to open in October of 2008 in Ontario and will be the first major indoor facility in the Inland Empire. This type of development and diversification is expected to support lodging demand growth for the Inland Empire in the future. 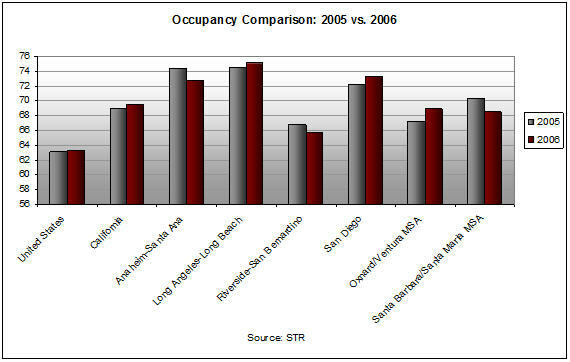 In 2005 and 2006, San Diego maintained the highest average rate for this part of the country, even commanding exclusively premium rates during numerous citywide conventions. This favorable position is supported by the city’s diverse economy, extremely popular convention center, and tourism attractions. High-priced leisure areas such as Coronado and La Jolla also support strong leisure demand at premium rates during particularly popular events, such as the 2008 US Open Golf Championship at La Jolla’s Torrey Pines. The markets of Southern California serve as a good comparative model of how diversification can lead to strong RevPAR. The vitality of a hotel industry relies on a healthy concoction of demand generators to nourish occupancy. Thus, the markets that have found the best mix of demand generators, including Los Angeles-Long Beach, Anaheim, and San Diego, also experience the best RevPAR trends. At the same time, new developments on the corporate, tourist, and convention fronts in other lodging markets in Southern California may soon bring them in pace with the trends seen by the aforementioned areas. Over 14 auto manufacturers have design studios in the area, including CALTY (Toyota, Lexus, Scion) in Newport Beach, as well as Ford’s Advanced Product Creation and Mazda Research. Kia America’s headquarters and Ford’s Premier Automotive Group headquarters are in Irvine. Orange County is home to other leading biotech firms such as Allergan, Peregrine Pharmaceuticals, Cortex Pharmaceuticals, Edwards Lifesciences, Braun Medical, Alcon Irvine Technology Center, and Advanced Medical Optics. Orange County has one of the most diversified high-tech economies in the U.S. and is home to a wide variety of firms such as Gateway, Boeing Integrated Defense Systems, Conexant, Linksys (Cisco), Jazz Semiconductor, Western Digital, Kingston Technology, FileNet, QLogic, Emulex, Mitsubishi Digital Electronics and Toshiba (Information Systems, Electronic Components, Medical Systems, Business Solutions). Google also has a major location in Irvine through its purchase of dMarc Broadcasting (Google Audio).